The UFC goes back to where it all began this Saturday night. UFC on Fox 23 will take place in Denver, Colorado's Pepsi Center arena. The main event of the evening will see Valentina Shevchenko face Julianna Peña. In perhaps an unintentional nod to history; the fight is a classic striker vs. grappler match up. Elsewhere on the card there are key bouts at welterweight and heavyweight to enjoy. Hometown hero Donald Cerrone faces Jorge Masvidal of American Top Team in a 170lbs clash that has many salivating. 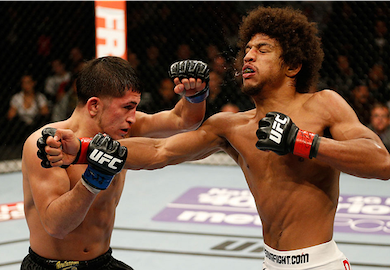 The rivalry between the two men has been stoked up by Masvidal; who called out Cerrone after his latest win. Heavyweight prospect Francis Ngannou looks to use former heavyweight champion Andrei Arlovski; as a stepping stone to a future title shot. Arlovski has lost three straight and is in desperate need of a victory should he still harbour title ambitions of his own. We've already given out two selections for this card in a past column which you can read here. One of which has had it's price go up since we published the article a few days ago. Let's go see what else we can find for this Saturday night of value. Selection: I've already broken down this fight in the future fights piece, so I'm not going to repeat myself. I think there's a glaring hole in Shevchenko's game that Peña can exploit. Pena is 10/1 for a TKO/KO with Coral and 9/1 with Sky Bet for a submission. I believe one of these is the most likely way that this fight ends. If you are betting on Shevchenko I'd look at a points victory. Generally that is available at around 2/1. This is a difficult card for betting and I think most favourites will take home wins. At the moment given the current lines, the only other two fights that interest me are the Alvey vs. Marquardt fight. Followed by the Caceres vs. Knight fight. I've broken down the Alvey fight already and the market is actually getting better for my selection as their price is drifting. It's in our “Future Fights” piece. I really like Alex Caceres as an underdog but I'd need to wait for his price to be north of 6/4 before pulling the trigger. As I've said many times in this column. Sometimes the right bet is no bet. Whilst there is potential for some value, it's not quite at the point where I'd be pulling the trigger on some bets. Sound off in the comments section or on our Facebook page if you've any picks for this weekend's fights. Most importantly do not bet what you can't afford to lose. Enjoy the fights! !